Additional data from the Cassini orbiter instruments – the Cassini Titan Radar Mapper (RADAR), Imaging Science Subsystem (ISS), and Visible and Infrared Mass Spectrometer (VIMS) – also show networked lineations,interpreted as fluvial networks [e.g., Elachi et al., 2005; Porco et al., 2005; Barnes et al., 2007; Lorenz et al., 2008]. 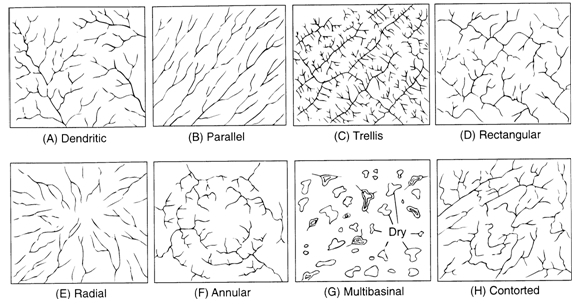 On Earth, regional terrain characteristics determine the network pattern, so identifying drainage patterns can reveal attributes of the terrain [e.g., Howard, 1967] (Image 1). In previous planetary studies, network analysis has proven useful in cases where data resolution is low and surface information, like slope, is limited [Pieri, 1980]. 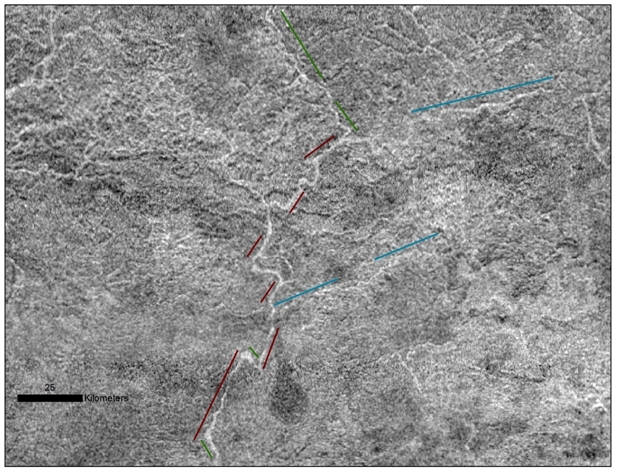 On Titan, on-going fluvial network delineation is likewise proving useful in revealing information about the geology of Titan [Burr et al. 2009]. Through use of a simplified algorithm modified from Ichoku and Chorowicz (1994), a variety of network patterns have been identified (Table 1). 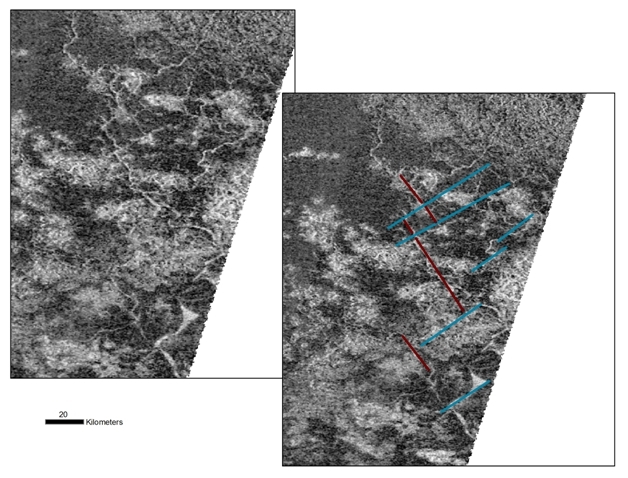 Several networks on Titan are rectilinear (e.g., Images 2 and 3). Rectilinear networks, characterized by bends and junction angles near 90 degrees, indicate control of surface flow by subsurface tectonic features. Though tectonism is a common process on icy satellites in the outer Solar System, Titan’s thick atmosphere and its associated processes can obscure views of the surface, and previous evidence for tectonism was uncertain (Collins et al. 2010). However, these atmospheric processes, specifically precipitation and fluvial run-off, have revealed evidence for subsurface tectonic structures in the form of rectilinear drainage networks. Rectilinear networks are also found on Earth. 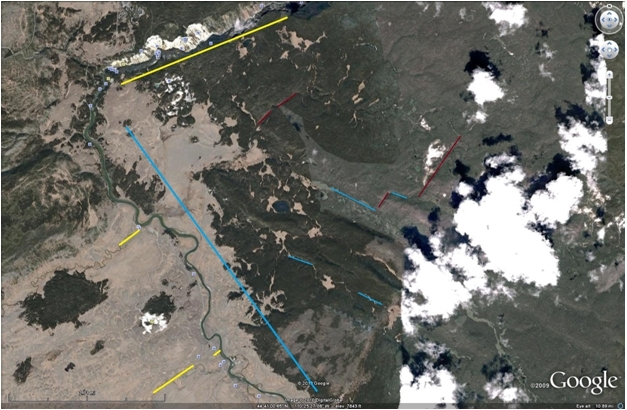 For example, rivers near Yellowstone, Wyoming, USA, exhibit a rectilinear morphology (Image 4). Geologic mapping of the region shows two dominant sets of faults, one set trending NW-SE and one set trending SW-NE. The links in the river network in this region frequently lie along these two trends (Image 4), as a result of control by this tectonic fabric. Image 4: Aerial view of part of Yellowstone National Park (centered near 44° 40′ N, 110° 23′ W), showing the right angular bends and junction angles of the Yellowstone river and its tributaries. Predominant link azimuths are NE-SW (red and yellow lines) and NW-SE (blue lines), which mirror local normal faults. The width of the image is 19 kilometers. Image credit: Google Earth. Continued investigations of Titan fluvial networks should yield additional insights into the factors controlling fluvial runoff. 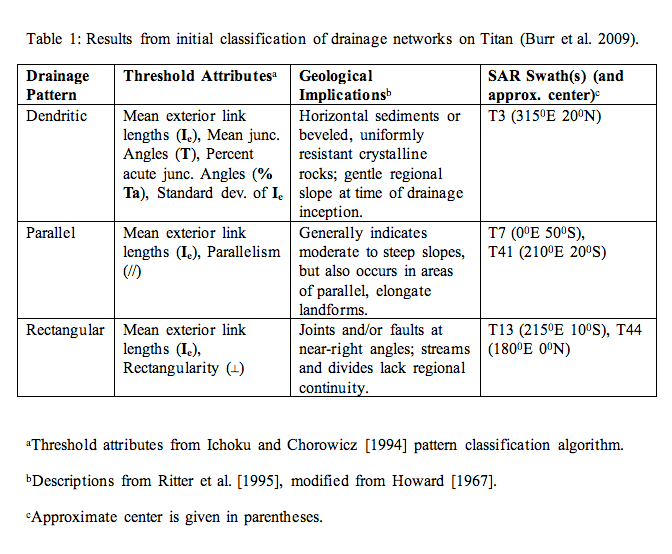 Network analysis provides one mechanism for mapping out the subsurface tectonic patterns on Titan. Pieri, D. C. (1980), Geomorphology of Martian valleys, in Advances in Planetary Geology, NASA Tech. Memo, TM-81979, 160 pp.